No matter whether an animal, a burglar or maybe yourself – if something moves in the coverage of this passive infrared motion detector, action is triggered. 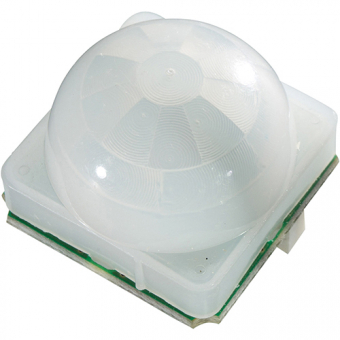 The PIR motion detector reacts to the heat radiation of moving bodies or objects. The compact SMD module has some characteristic features which guarantee universal applicability despite its small size.Very high sensitivity, adjustable in 4 steps. Integrated window comparator, TTL- and CMOS-compatible open collector output, which can also control LEDs and relays directly. Additional analogue output for your own evaluation circuit.